We rent towel’s and linen’s for the following industries. Great Rates. pick up and delivery. White glove service! Why Should You Rent Your Towels. No Labor Cost. Renting frees you of the hassle and expense of laundering, drying, folding, and managing your own towels. No Equipment, Install and Maintenance Expense. Renting frees you of the hassle and expense of acquiring, installing, maintaining, and repairing your own washers and dryers. Increase Efficiency. Renting provides you and your employees more time to focus on your customers and growing your business, instead of doing laundry. Improve Morale. Renting relieves your employees of the burden of laundry. Renting will restore a sense of pride to employees in doing what they were hired for. Profit. Create a new profit center for your business. You can provide towels to members as a "convenience", for a small fee. Service. Our customer service program includes regular phone calls and follow-up visits to make sure everything is going smoothly. Image. Providing towels for your clients/tenants/members suggests privilege, status, and a sense of being served or spoiled. Let us help you "spoil" your clients. Product Quality. 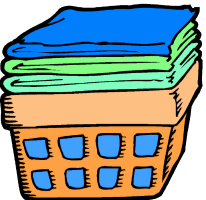 We hand fold all our towels to ensure no holes, tears, worn out or stained towels get out of our laundry. Other laundries machine fold their towels for speed of production guaranteeing the folder has no chance to pull a towel out of service for re-wash or to be taken out of service because it can no longer be used as a towel. Cleanliness. We ensure that your towels are clean and sanitary. When your customer reaches for a towel you can be certain it will be clean & dry. We take pride in providing the best towel service around. We even provide band new towels to each new customer. These new towels will be washed and returned to you each week. Your towels will always be washed separately from other customers towels. We do rental house sheets and towels for the Hamptons.